Is it Time to Switch to an Apple Laptop? Ion [ahy-uhn, ahy-on] noun: 1. a charged atom 2. nVidia's new two-chip product that works with the Intel Atom netbook CPU for affordable, portable performance. I'm going to give you the same advice I'm currently giving to all my buddies: Unless you absolutely need a sub-$500 portable right now, wait. Imagine a netbook that can actually play modern first-person shooter games. Or a tiny $500 PC that can quickly encode video. It's possible--I just saw it with my own two eyes. nVidia recently came in to show off its two-chip Ion platform, which marries an Intel Atom CPU with nVidia's 94000M graphics processing unit. Honestly, the results surprised me. Let me back up for a second. I've been complaining that, as neat as netbooks may be, I'm not buying one until their makers replace their lame integrated graphics. I want to play games that are a little more sophisticated than Peggle, and to watch good-quality video on the machine's 10.2-inch screen. And that's exactly what's happening here. nVidia product line manager David Ragones didn't didn't have an actual netbook on hand (he said that we were getting the same demo that manufacters have started seeing in the past couple weeks), but the proof of concept was right there, in his hand. 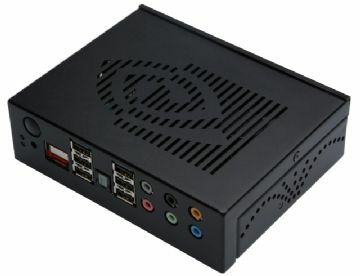 On a tiny Pico ITX motherboard sits a single Atom CPU, nVidia's GeForce 9400M GPU, an HDMI-out, dual-link DVI, a SATA connection, a USB 2.0 port, and an ethernet port. That array of components dwarfs what you see on current netbooks, where you're lucky to get VGA-out and more than two USB ports. As for the performance, while we didn't have the opportunity to throw our own tests at the platform, we did try a few quick side-by-side demos. In one corner was Acer's Aspire One. The first test was last year's hit game Call of Duty 4: Modern Warfare. On the Aspire One, the game bombed out before even loading. Blame Intel's GMA945 graphics. I often do. On the test system, I started blasting my way through the first mission at 1024-by-768-pixel resolution with respectable speeds (a solid 25 to 30 frames per second). While the textures were a little flat--hey, I'm not expecting GTX280 performance here--the results were impressive. Not to mention that they're a huge step up from what we see on current netbooks, which can't even get out of neutral. Another test that nVidia loves showing off is video encoding. On the nVidia wondermachine, we saw a video, The Plush Life, get encoded for an iPhone through a program called Badaboom. The app whipped through and encoded the 720p, 30-fps video at a rate of roughly 1 fps. (That's very good.) It speeds through tests thanks to CUDA-based software--that is, Badaboom is one of the few mainstream commercial applications that use the GPU for something other than just playing games. Meanwhile, the Aspire One chugged along, encoding video with iTunes--software that runs off the CPU. Its total run time was about 20 minutes. Now, I admit that this was a slightly flawed comparison. I'd rather see Badaboom running on both machines, but that's a CUDA-only application. The truth is, I've never had a problem with the Atom processor; it enables good performance at a bargain-basement price. The rest of the chip set is what has been holding netbooks back. But here's where tech journalists (and I'm including myself) need to own up to something: We've gone too easy on netbooks. I always figured, "Eh, it's a slick-looking mini-notebook that costs under $500. If it's meant only for Windows XP and basic computing needs, so be it." But why stick to low expectations? At our demo, Ragones was quick to chime in: "That's just Intel positioning around the limitations of their hardware." He also says that computers using Ion can run not only ten times as fast as current netbooks but also five times faster than straight Centrino-platform laptops using Intel integrated graphics. According to nVidia, the thermals of an Ion-platform machine will be lower than those of a current Atom system, and the idle power will be comparable, while maintaining roughly the same battery life. That means that machines using Ion could run Vista--and, nVidia says, Windows 7. (No doubt, Microsoft is more than happy to dump XP and push Vista and Windows 7 these days.) Such systems will be able to process and output 1080p video sans stuttering, too. Of course, that says nothing of the potential for incredibly tiny desktops that still pack a punch. Staple on a couple hard drives and turn this unit, and the makers could sell it tomorrow. Heck, incorporate the guts into a TV, and you have a turbocharged media center without the extra box in the living room. For some perspective, the Mac Mini measures 6.5 by 6.5 by 2 inches, but nVidia's l'il system occupies only about half as much space. And the black box that nVidia showed was as big as it was only due to the daughter board that handles additional connections (such as 7.1 audio). Does this mean that nVidia is shutting out Via's mobile CPUs? "We continue to work with Via to promote small-form-factor platforms based on discrete GeForce GPUs and Via Nano CPUs," Ragones says. "Via Nano platforms fully support full PCI Express x16 expansion for GeForce graphics." All right, here are the big questions: How long before we can lay hands on computers using this configuration? As soon as next June, according to Ragones. And how much could it add to the price of current netbooks? Not much. "At most," he says, "it would tack a $50 premium onto the price." But that $50 could make a world of difference between what a netbook can do now and what it will do in a couple months.